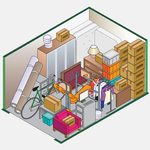 We have over 30 different size units to meet every storage need. We cater to residential, student and commercial customers. There is a loading dock available. We are located one block from the Eastman School of Music and behind Tavern 58. Includes a 5% discount for Auto Pay. College storage. We will supply the POD at our facility. You fill it up. We cover it and store for the summer. 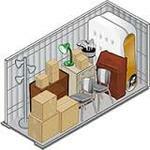 The storage will be in our secure and climate controlled facilty. When you return to school we will bring the POD out to the dock for you.